The clocks ‘spring forward’ on Easter Day this year which means that the splendid stately homes of the East Riding of Yorkshire will be open by the time of the festival. 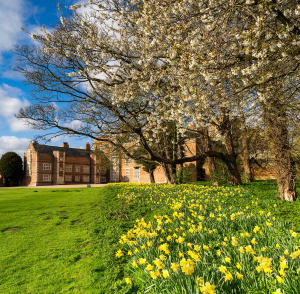 Whether you’re a visitor or a local, make the most of the festival weekend with a springtime* visit to one or all of the three gems of the county – Burton Agnes Hall, Sledmere House, and Burton Constable – all on the doorstep of Beverley. The festival includes some beautiful examples of the pastoral in music. In the opening concert we are treated to a performance by tenor Nick Pritchard of Beethoven’s joyous An die ferne Geliebte, full of imagery of love through nature, and generally recognised as the first ever song cycle (celebrating its 200th anniversary in April). At the coffee concert on Saturday we hear Schubert’s effervescent Shepherd on the Rock, in which soprano Mary Bevan is joined by clarinettist John Slack, as shepherd and echo converse across the valley. If thoughts turn to romantic love in the spring then our incredible opera gala in the East Riding Theatre must not be missed. The evening includes one of the greatest 12-minute stretches in all music, the ultimate boy meets girl: the Act 1 finale of Puccini’s La Bohème. A cocktail of meetings and partings, the gala also features extracts from Don Giovanni, La Traviata, and Giulio Cesare. All of this is sung by phenomenally talented young superstars of the country’s opera stages. We’re thrilled to announce the full programme here. The chamber music of the festival is similarly full of passion and romance. In the opening concert alone we hear two works with particularly beautiful slow movements. The melody of the Andante of Schumann’s great piano quartet is an exquisite love song between the instruments, and the slow movement of Brahms’ violin sonata in D minor offers a moment of sublime tenderness and peace in this otherwise tempestuous piece. Katy Hamilton’s talk before this concert, “Of romance, role-models and … hedgehogs? Johannes Brahms meets the Schumanns”, will give an insight into the complex musical and personal relationships between the Schumanns and Brahms. Join us to learn more about the festival’s cornerstone composers from this distinguished Brahms scholar, over a glass of wine. Remember to book your tickets now through the East Riding Theatre. See you in one month’s time for a glorious spring* weekend of music-making! * We can’t guarantee the weather!